Supporters of Westminster Christian Academy athletics are committed to the transformative opportunities available to WCA students through sports. Each year over 300 students of all ages compete in 13 different sports. The members of the Crusader Club contribute to the continued growth and success of the Westminster Christian Academy athletic program. Every contribution to Crusader Club (whether time or resources) will directly benefit our student athletes as they "practice" things like working together, serving others, resolving conflict, developing persistence, and much more through the team environment. Your generosity funds special projects and the goals of WCA's athletic department which ultimately center around raising up a generation of godly men and women of Christlike character. Gifts to the Crusader Club are gifts to Westminster Christian Academy and are tax-deductible to the fullest extent of state and federal laws. While gifts are tax deductible, the IRS requires you to reduce the deductibility of your gift by the fair market value of any benefits you receive from your Crusader Club membership and your tax receipt will reflect this. You may decline all benefits to receive the full deductibility of your gift. 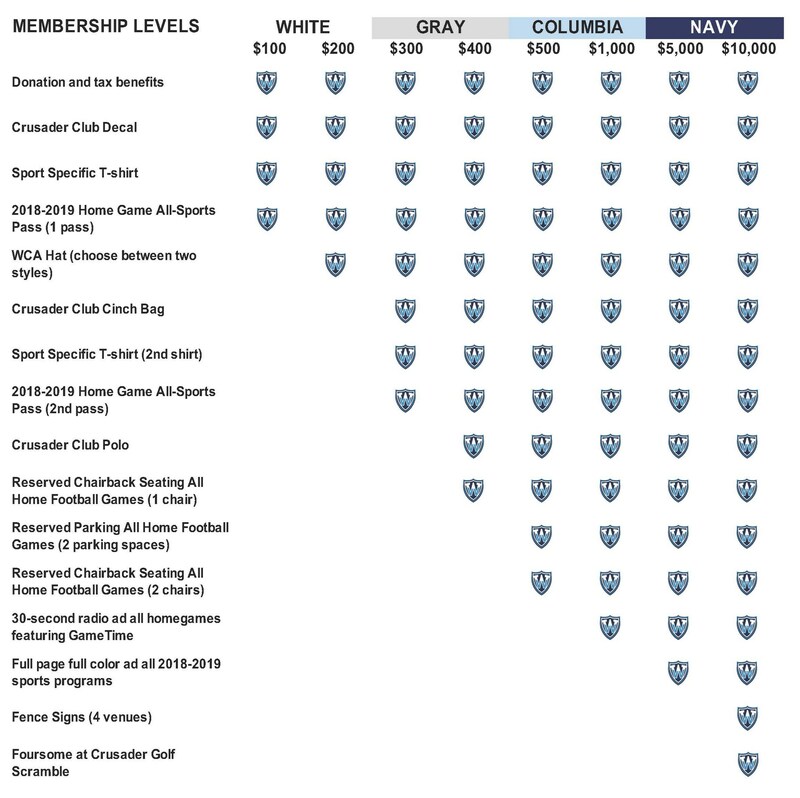 In order to deduct 100% of your Crusader Club membership, the donor must submit in writing - via letter or an email - a waiver of benefits at the time of making a pledge and/or contribution. A waiver of benefits communication from the donor precludes the donor from receiving rights to any goods, services, and anything in exchange for a contribution. For more information regarding tax-deductibility, donors are encouraged to consult with a financial or tax advisor.